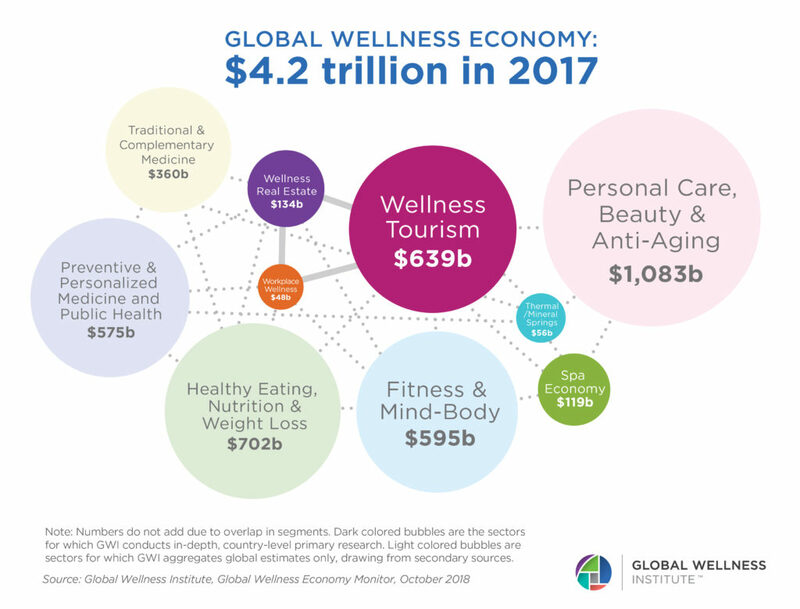 Cesena, Italy – October 6, 2018 – The global wellness industry grew 12.8% in the last two years, from a $3.7 trillion market in 2015 to $4.2 trillion in 2017, according to an in-depth research report, the 2018 Global Wellness Economy Monitor, released today by the nonprofit Global Wellness Institute (GWI). This all-new data on the ten markets that comprise the global wellness economy provides fresh evidence that wellness remains one of the world’s biggest and fast-growing industries. For more information, or to speak to GWI researchers, contact Beth McGroarty: beth.mcgroarty@globalwellnessinstitute.org or (+1) 213-300-0107 or Betsy Isroelit, betsyisroelit@gmail.com, (+1) 213-300-0108. **Global health expenditures data: WHO, Global Health Expenditures Database. 2015 data most recent year available. ***The GWI develops original data for five sectors: wellness tourism, spa, thermal/mineral springs, workplace wellness and wellness real estate. For the other 5 sectors, secondary global industry data is evaluated and aggregated.